The League Story so far, written by Geoffrey Knights, was published in 2009 to provide a record of the club’s first 12 years as a Football League club. 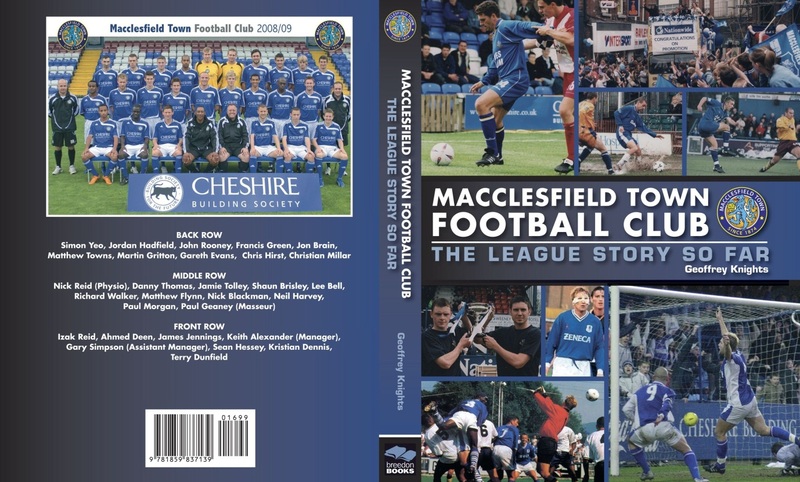 Macclesfield Town won promotion in 1997 at the second attempt and are currently second only to Wycombe Wanderers for continuous membership of the Football League since automatic promotion was introduced. The book relates the club’s trials, tribulations and triumphs, with an emphasis on events on the field of play, although the more important dramatic off-field happenings have also been included. Competing as one of the smallest clubs has not been easy, but there have been many inspired moments – from a single season in the former Nationwide Division Two, victories over higher League opposition in Cup competitions, to being Play-off semi-finalists one season and losing Northern Area Finalists in the Football League Trophy in another. Over the years there have been brilliant individual performances. Many younger players have developed their skills at the club with some moving on to play at a higher level, while more experienced players have become legends in their own right. Copyright © MTFC / Geoffrey Knights.